Dodgeball Starts In October 2018! See you in the Fall! 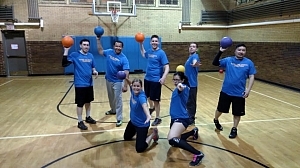 Join Tuesday night Dodgeball. It's the most fun you will have in the city. Everyone plays at the gym then heads to the bar Commonwealth after games. Team cost is $449 with the Bar Sponsor league discount $100 (normally $549). Contact Cities and Sports if you would like to play. We will see you in the fall of 2018! 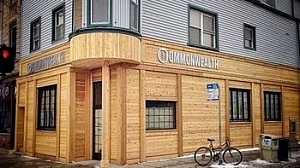 Commonwealth Tavern in Roscoe Village is our new league sponsor for Dodgeball! It's a fantastic bar with a great crowd! They are providing all teams 20% off team check on game nights. We look forward to the fun! 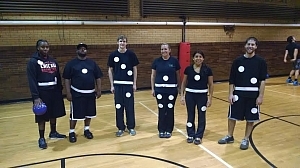 Halloween Dodgeball Fun! We Played and Partied in Costume. Halloween Dodgeball was a blast!!. We had Care Bears, Domino's, Farmers and much more. 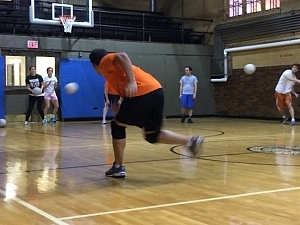 It's our 3rd year of Halloween Dodgeball. We played in costume and then headed to the Pony to win prizes. Can't wait to see all the great costumes next year! !